MSP Bill Walker has resigned after being convicted last month of a series of domestic abuse offences. Walker, 71, had been facing pressure to step down from the Scottish Parliament over the offences committed against three of his ex-wives. More than half of Scotland's 129 MSPs had backed a motion calling for him to go. The independent MSP for Dunfermline said a "media onslaught" had made it impossible for him to continue. Walker, from Alloa in Clackmannanshire, is due to be sentenced in late September. He had been found guilty of 23 charges spanning almost three decades, following a trial at Edinburgh Sheriff Court. The attacks had been carried out against his ex-wives and a stepdaughter between 1967 and 1995. But in summary cases heard in sheriff courts in Scotland, the maximum sentence that can be handed down is one year, which would have allowed Walker to remain as an MSP even if he is jailed. In a statement, Walker said he had submitted his resignation to the Scottish Parliament as MSP for Dunfermline. He added: "It has been increasingly difficult for my wife and my staff to deal with the media interest in my case. That same media onslaught has also made it impossible to properly represent my constituents and their interests. "My trial process on domestic abuse charges still continues at Edinburgh Sheriff Court with the sentence not due to be announced until September 20 after the receipt of the reports ordered by the court. "However, circumstances have made it very difficult to continue as [an] MSP, hence my decision to withdraw now." Walker's spokesperson said the former MSP's position was that "one woman scorned was joined by another woman scorned", and added that Walker hoped to clear his name in the Court of Appeal. As a constituency MSP, Walker's resignation means a by-election will be held in Dunfermline. Willie Rennie, leader of the Scottish Liberal Democrats, said he was pleased Walker had gone. "Bill Walker should have understood immediately the gravity of his situation but it has taken 16 days for the penny to drop. "It is sad that he continues to blame others instead of taking responsibility himself for his own actions." 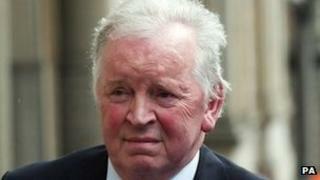 Scottish Labour's Claire Baker said: "I am pleased that Bill Walker has finally done the right thing and resigned. "The people of Dunfermline deserve better and each day he remained an MSP was an affront to parliament and democracy." An SNP spokesman said Walker's position was "untenable". He added: "People across the political spectrum have been demanding that he resign his seat, and it is right that there will now be a by-election so that the people of Dunfermline can elect a new MSP." Scottish Conservative leader Ruth Davidson said: "There is no place in the Scottish Parliament for people who have committed the crimes that Bill Walker has. "It's a disgrace he thought he could hang on and the idea that the media is to blame is a joke." A spokeswoman for the Scottish Parliament said: "The presiding officer has received the resignation of Bill Walker, effective from Monday. "There will now be a by-election in Dunfermline and she will consider when that will take place and notify the political parties in due course." Scottish Secretary Michael Moore had said, prior to Walker's resignation, that he would write to Holyrood's presiding officer and political leaders in an effort to finding the "right outcome". Mr Moore said it was "wrong" for Walker to serve as an MSP. In the rules, laid down by Westminster, parliamentarians are only automatically expelled if they are jailed for more than a year. However, the maximum sentence that can be handed down in summary cases heard in sheriff courts in Scotland is one year. Earlier, Scottish First Minister Alex Salmond called for Holyrood to be given power over the disqualification of MSPs. Mr Salmond has written to UK Deputy Prime Minister Nick Clegg arguing that the Scottish Parliament should have the ability to decide the arrangements in such cases.